Stock # 117012, 350 ci V8 Engine, Automatic, 72613 mi. 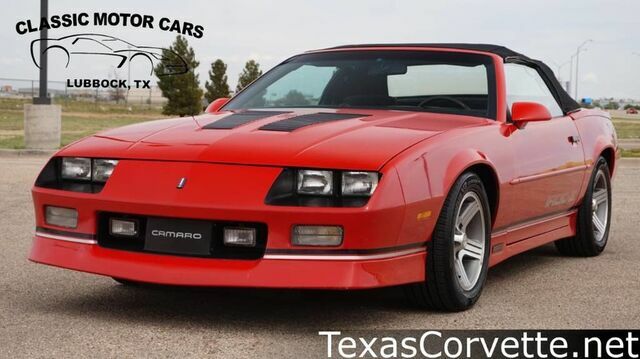 This 1990 Chevrolet Camaro IROC Z is offered to you for sale by Classic Motor Cars. Your buying risks are reduced thanks to a CARFAX BuyBack Guarantee. One of the best things about this Chevrolet Camaro is that it has low, low mileage. It's ready for you to truly break it in. The look is unmistakably Chevrolet, the smooth contours and cutting-edge technology of this Chevrolet Camaro IROC Z will definitely turn heads. Just what you've been looking for. With quality in mind, this vehicle is the perfect addition to take home.